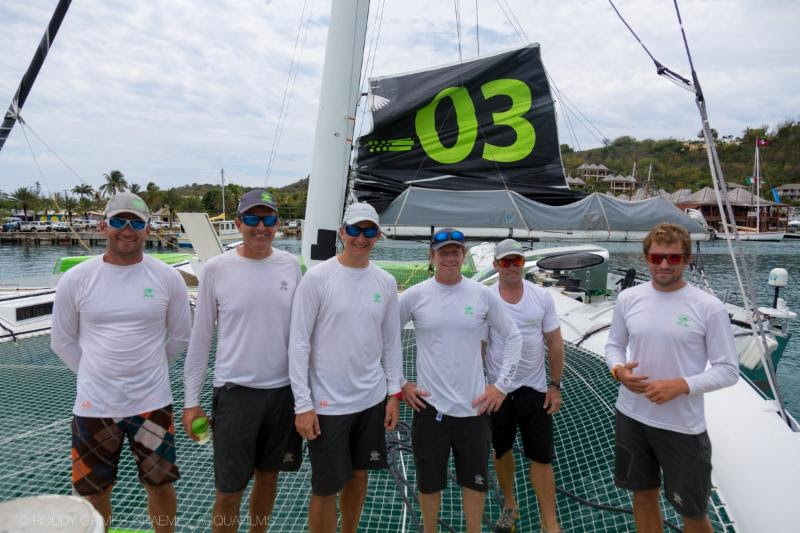 Lloyd Thornburg’s MOD70 Phaedo3, skippered by Brian Thompson, left Antigua on Wednesday [April 20] at noon local time bound for Bermuda, a 945 nautical mile journey. The team are planning to establish a course record from Antigua to Bermuda, prior to the inaugural Antigua to Bermuda Race, which will be run in May 2017. After a hearty breakfast and a few fond farewells, Phaedo3 left the dock and headed out of Falmouth Harbour in Antigua. 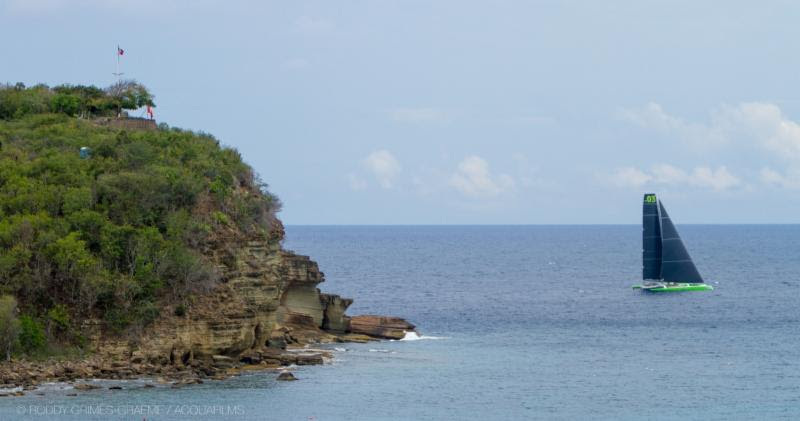 Setting a full main and gennaker, Phaedo3 lifted up her skirts and crossed the start line off Fort Charlotte, Antigua. He said, “A small high pressure system currently near Bermuda has the biggest affect on which route we will choose. Once we get going, we can compare the actual wind to what has been forecast. If the forecast is correct then it will probably remain so and we should follow the predicted routing. “We might be able to cut the corner, but the routing to the west is keeping us away from the light air. This routing forecast is specifically for Phaedo3, as it is based on our polar data. 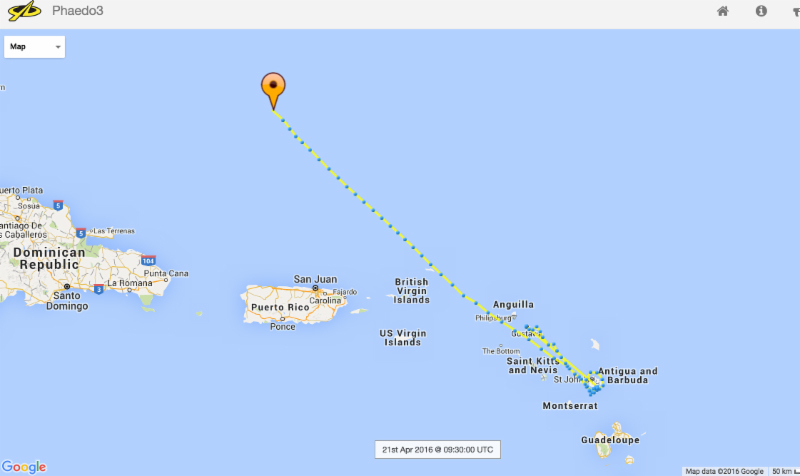 If a normal monohull was routing for Bermuda they would be given a different route. “For Phaedo, the wind speed differential is much larger; in 10 knots of breeze we will be sailing at 16 knots. In 15 knots of wind our speed increases to over 20 knots, so it is worth our while to sail the extra miles. “Compared to next year’s race, we are going a little earlier. I think that if we had left exactly a year before the Antigua to Bermuda Race, we would have had much more stable conditions with less winter storms. According to Phaedo3 weather routing, the team should be in Hamilton, Bermuda sometime between the evening of Saturday 23 April to the evening of Sunday 24th April.